Wallan is a rapidly urbanising town near the junction of the Hume Freeway and the old Hume Highway (now the Northern Highway) 45 km north of Melbourne. It was named after the Wallan Wallan farm or pastoral station occupied by Major John Boyd (1839). 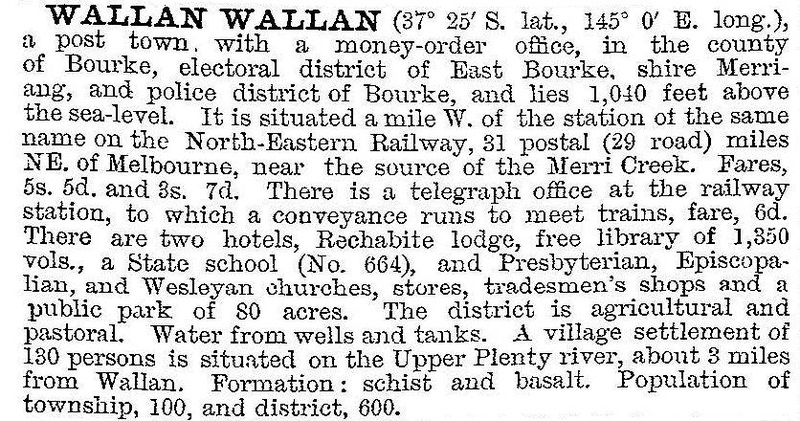 The Wallan Wallan township was surveyed in 1853 and a hotel was opened in the same year. A school was probably opened in 1854, and a Scots church school opened in 1858 was on the site subsequently occupied by the State school. Anglican, Presbyterian and Catholic churches were opened during the 1870s-80s. Throughout the first half of the twentieth century Wallan was a rural village which traffic passed through on the Hume Highway before climbing the Pretty Sally hill and crossing the Dividing Range. In 1959 the Hume Freeway was opened, bypassing Wallan. In the early 1970s Wallan began to serve as a dormitory housing area within commuting distance of metropolitan Melbourne. By 1978 81% of Wallan’s employed persons had jobs in Melbourne. During the 1980s Wallan’s population doubled to about 2000 people, another 1000 were added between 1991 and 1996 and over 2000 between 1996 and 2006. In addition to Wallan’s two hotels, three churches and State school, the recent growth has added sporting and recreation facilities, a secondary college (2006), a senior citizens’ club and a modern shopping centre. Growth has also brought heavy lorry traffic through Wallan along the Northern Highway. Plans for a bypass were stalemated in 2012: a route suited to Wallan was opposed by Kilmore’s residents. In 1997 a 1000 ha housing estate was announced on the former Heytesbury horse-stud property which was part of the Holmes a Court interests. Set in a valley north-east of Wallan, the estate has a mixture of equestrian facilities, housing and a showpiece golf course. Further development south-east of Wallan includes the 186 hectare Wallara Waters development adjacent to the Hume Freeway and 1 km from the town centre. It has provision for 1500 homes. Wallan East has the railway station, one of Wallan’s two hotels and a prospective housing estate and drive-in shopping centre. It also adjoins the Hume Freeway. Wallan primary school had 596 pupils and Wallan secondary college had 554 pupils in 2014.